Current research has demonstrated that trace fossils and their related ichnofabrics can have a critical impact on the fluid-flow properties of hydrocarbon reservoirs and groundwater aquifers. Most petroleum-associated research has used ichnofabrics to support the definition of depositional environments and reservoir quality, and has concentrated on siliciclastic reservoir characterization and, to a lesser degree, carbonate reservoir characterization. The use of ichnology in aquifer characterization has almost entirely been overlooked by the hydrologic community because the dynamic reservoir-characterization approach has not caught on with hydrologists and so hydrology is lagging behind reservoir engineering in this area. The objective of this research is to show that (1) ichnofabric analysis can offer a productive methodology for purposes of carbonate aquifer characterization, and (2) a clear relation can exist between ichnofabrics and groundwater flow in carbonate aquifers. 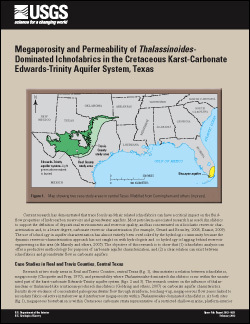 Cunningham, K.J., and Sukop, M.C., 2012, Megaporosity and permeability of Thalassinoides-dominated ichnofabrics in the Cretaceous karst-carbonate Edwards-Trinity aquifer system, Texas: U.S. Geological Survey Open-File Report 2012–1021, 4 p.